Reuters and Times of Malta photojournalist, Darrin Zammit-Lupi, joined the Migrant Offshore Aid Station (MOAS) team as the Foundation's volunteer official photographer on board its vessel Phoenix on its latest mission rescuing migrants in the Mediterranean. A barely perceptible dot on the horizon, disappearing every few seconds behind the rolling waves, a rubber dinghy carrying a group of migrants is very easily missed if you don't know where to look. The Migrant Offshore Aid Station (MOAS) ship Phoenix, having set off from the Italian island of Lampedusa the night before in the middle of a lightning storm that lit up the sky with constant flickers, had, for the past five hours, been making its way towards the dinghy's last known position. MOAS, which started operating at the end of August has, to date, been involved in the rescue of some 2,200 migrants crossing from Libyan shores. The Malta-based, privately funded humanitarian initiative was set up by US citizen, Christopher Catrambone, and his Italian wife, Regina, after the October 2013 Lampedusa tragedies, which left hundreds dead. They were inspired by the Pope's appeal for entrepreneurs to do something tangible to help and to go beyond just donating money. They bought, refurbished and equipped the 40-metre ship Phoenix and took on a professional crew of rescuers, seafarers, paramedics and humanitarians. As soon as I heard about MOAS, I felt inspired by the premise that it operates under - that no one deserves to die at sea. I'd wanted to get on board the Phoenix for the past several months, knowing I needed some new photos of rescues at sea for a book project I've been working on, and will shortly be publishing, about migration. There was one small problem - space on the Phoenix is at a premium on board and every inch is dedicated to saving lives. The only way I could get on was to convince them that even great photographs help save lives. I persevered as I felt it would be worth every moment of the vacation time I'd have to utilise to do that - it beats a cruise at sea on some luxurious cruise liner (sort of thing I'm not particularly keen on, having covered the Costa Concordia disaster a couple of years ago). 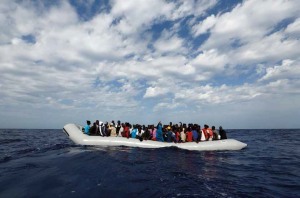 The ship had already been heading south to its usual area of operations when the call alerting MOAS to the migrants came in from Rome's Maritime Rescue Coordination Centre as the Phoenix crew were having breakfast. The Phoenix intercepted the dinghy close to the Bouri oil fields, in the Libyan search and rescue region. I watched from the foredeck as we got closer and closer, trying not to be too distracted by a pod of dolphins on the port side of the Phoenix. The Italian anchor-handling vessel Asso Ventiquattro was monitoring from afar but would not intervene unless the situation became critical. Approaching the dinghy with the ship would be a recipe for disaster. 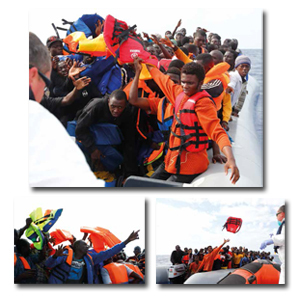 All the migrants would try to push and shove their way to one side of their boat, causing it to capsize.